For most players, traditional golf is an arduous process of learning a game that is difficult to master. The success oriented and proven SNAG® system of learning to golf is known to be simply the world’s leader in ‘First-Touch’ golf. Now enter the next step . . . Super SNAG®. Super SNAG® was designed as the bridge between regular SNAG® and traditional golf. It allows a player to still have the unbelievable success at ball striking as regular SNAG®, but with the added challenge of a much more accurate benchmark in learning how to score and to demostrate precise course management skills. Basically, everything is smaller . . . the clubs, the ball, the rollerama, the bullseye targets, the lower tee, the flagsticky and a more traditional grip. Oh yeah, it is time to step it up to improve your skills and this is the perfect combination for Junior High aged players and adults who still need full striking success – not failure and intimidation as is often found when first starting with traditional golf. What remains is our patented indoor/outdoor capabilities with our balanced clubs, a smaller SNAG® ball that weighs EXACTLY the same as an actual golf ball and the SNAG® teaching methods which has produced millions of successful golfers. 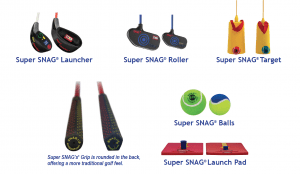 Super SNAG® is yet another innovation from SNAG® to create core golfers with scoring skills and passion who are successful at golf. Our entire purpose is to craft players that transition to our golf courses and become productive lifelong golfers which our industry so desperately needs. Super SNAG® gets that Done! See our side-by-side Super SNAG® equipment illustrations below.